Uber filed documents for its long-awaited initial public offering (IPO) on Thursday. The ride-hailing company could net a valuation of more than R1,4 trillion as it hits the stock market. Lyft, the company's biggest competitor, went public in March, and its stock has dropped more than 20% since. Uber has officially filed for an initial public offering (IPO), according to regulatory documents filed on Thursday. The company's long-awaited prospectus, which was filed confidentially in December, was made public for the first time on Thursday, providing the first public look into Uber's investor pitch and its plans for future growth in ride-hailing, food delivery, self-driving cars, flying taxis, and more. Uber will list on the New York Stock Exchange under the ticker symbol UBER, according to its prospectus. Morgan Stanley, Goldman Sachs, Bank of America Merrill Lynch, Barclays, Citigroup, and Allen & Company, among others, are underwriting the offering. "Our continued success will come from stellar execution and the strength of the platform we have worked so hard to build," CEO Dara Khosrowshahi said in a letter in the filing. "Our network spans tens of millions of consumers and partners and represents one of the world's largest platforms for independent work." Uber did not disclose in the filing the price at which it plans to list, though the company's public valuation could easily top that of earlier venture-capital rounds, especially given that Lyft's offering last week was oversubscribed. Before the stock prices or begins trading, Uber's executives and bankers will head out on an investor roadshow to drum up demand across the country. Bloomberg reported on Tuesday that the roadshow is likely to kick off this month, with shares hitting markets in May. 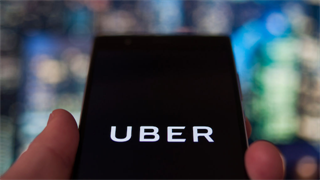 As a private company, Uber has raised nearly R280 billion in venture capital across more than a dozen funding rounds that have left the company valued at a reported R1.6 trillion. If the valuation holds, Uber would find itself ranked somewhere between the railroad operator Union Pacific and its fellow tech giant Salesforce in terms of the most valuable public companies. That massive amount of capital raised over the past decade has helped Uber to cover most of the world's cities in more than 60 countries, compared with Lyft's much narrower focus on the US and Canada. Those funding rounds have also helped subsidize a massively unprofitable ride-hailing business while also investing in other ventures in notoriously expensive self-driving-car research. 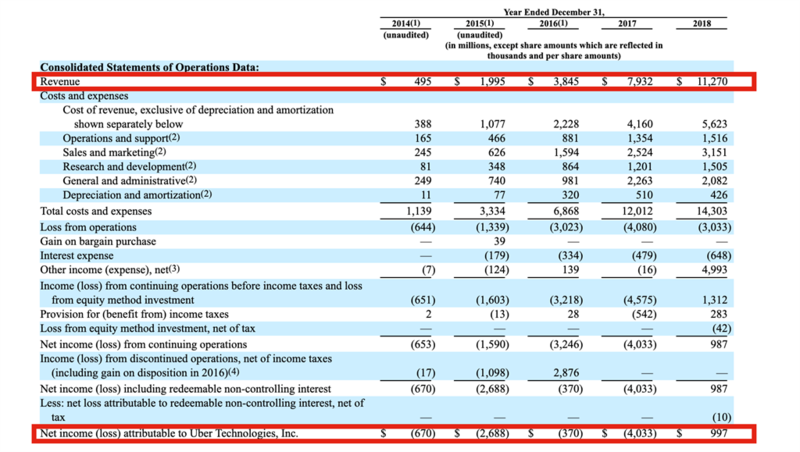 Unlike Lyft, Uber has been self-reporting some quarterly financial information, so the numbers disclosed aren't completely new, but they are our first look at audited financial statements. 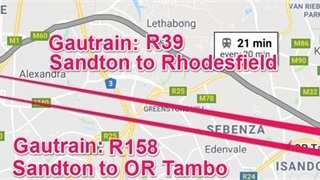 However, in the IPO filing, Uber said it was cash-flow positive in 2018, with a net income of R13 billion. That's a massive increase from its 2017 full-year loss of more than R56 million, according to its disclosed balance sheets. At the same time, Uber's revenue has grown by more than tenfold since 2014. Last year, the company brought in R157 billion, according to the filing, up from $495 million (unaudited) (R6 billion) in 2014. While Uber is best known for hailing a car ride with the tap of a button, the company has plenty of other bets. In Pittsburgh (as well as in Toronto and at its San Francisco headquarters), for example, the company's advanced technologies group (ATG) is developing self-driving-car tech to power an eventual autonomous taxi fleet. Uber Eats, meanwhile, is one of the fastest growing segments of Uber's business. In many areas, the food-delivery startup is growing even faster than Uber's ride-hailing business. 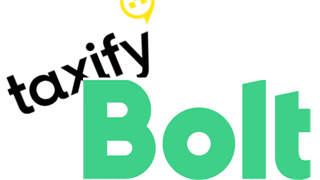 Executives have told Business Insider that Eats is the first of many soon-to-come examples of other services piggybacking on the Uber platform. Groceries could soon be the next entrant to that delivery offering, and the company is rapidly scaling up a team to deliver pantry items in its Toronto office, Business Insider reported last year. In 2018, Uber purchased a bike-share company called Jump bikes. Like Lyft's purchase of the bike-share operator Motivate, Jump is Uber's pawn in the bike-and-scooter wars that have overtaken many of the world's cities in recent years. Rachel Holt, Uber's head of new mobility, said at Business Insider's IGNITION conference in 2018 that users could expect to see a "pretty massive" expansion of the bikes and scooters into more cities this year. Lyft, Uber's biggest competitor, went public first in March. However, the stock's more than 20% decline over its first two trading weeks is expected to cast a shadow on Uber's offering. "Lyft shares continue to be weak as many investors we have spoken with have worries about Uber's impending S-1 and roadshow which could be a dark shadow over Lyft's stock in the near-term," Daniel Ives, an analyst at Wedbush, said in a note to clients on Thursday. "With Uber, investors will soon have a second option to make a bet on the future of mobility and transportation with the clear market share leader," Ives said. 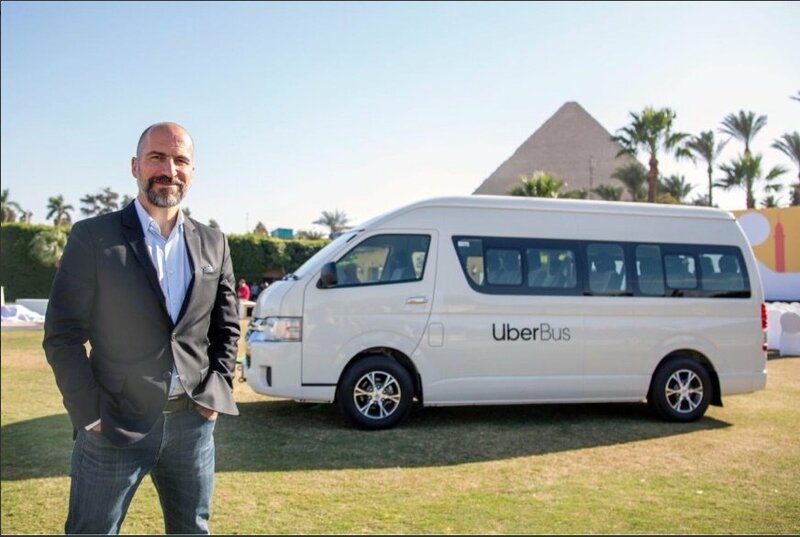 In his letter, Khosrowshahi said the company now has an even greater responsibility to deliver on its promises. "Taking this step means that we have greater responsibilities - to our shareholders, our customers, and our colleagues," he said. "That's why, over the past 18 months, we have improved our governance and Board oversight; built a stronger and more cohesive management team; and made the changes necessary to ensure our company culture rewards teamwork and encourages employees to commit for the long term."